Ann Green, E-RYT, has 25+ years expertise cross pollinating athletics, yoga, manual therapy + pain management. 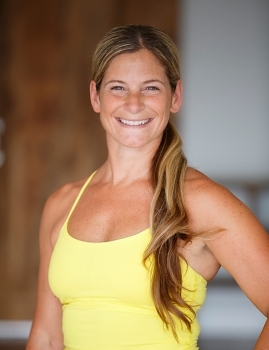 She is the founder of BLiSS Ann Green Yoga. As an Educator she creates a unique Yoga Therapy experience. A contributor to Canadian Sports Medicine + Orthapaedic Surgery Councils, Ann's also featured in Yoga Journal, The Daily Tea + The Hockey News. There are two major issues around pelvic floor health: being too toned or not being toned enough. The effect of pelvic floor issues ranges from breathing health, back health, and most importantly, healthy continence. Our pelvic floor is like the root of our entire energy system and, therefore, a vital part of our healthy, loving relationship with ourselves. In this workshop, we will explore the pelvic floor and its healthy patternings; its places of harmonizing for optimal, foundational health through mind body connection; and general knowledge of the pelvic floor. We will use prana and breathing techniques to tone the pelvic floor as well as to release the pelvic floor; learn to not push so hard, to slow down, and to cultivate subtlety; and begin to understand the role of the pelvic floor muscles as part of the body’s core stabilization system. Technology embraces so much of our lives and in almost every aspect. Our body is a temple of technology, one that we will explore through the tapestry of tantric knowledge fused with mind–body science. We will humbly begin understanding restrictions in our own being in order to give rise to the knowledge and adventure freedom-embodiment can create in ourselves and our communities. An explorative look at the mind–body medicine model to support the knowledge of space in and of the body. A playful approach to yoga that embraces the whole experience of space-expanding energy. You will learn the freedom of the chakra meditation model, based on tradition and ritual, to support engaging spirit in our daily teaching and models and practice. Discover poses that open your heart, and support your mind and spirit. Lead yourself with love and curiosity into a beautiful practice of asana and pranayama, relearning body confidence. A gorgeous ebb and flow to reset with an attitude of self-love. Deep self-care and playful places of wide-open chests, supportive shoulder suppleness, all rebuilding body bravery. This workshop of heart opening will enhance your confidence and support you with love and courage, as we journal briefly, and flow sweetly and subtly to build the resonance and reverence of having your own back.